Janette Oke, famed author of the Love Comes Softly series, is reportedly praising Twentieth Century Fox for the company’s adaptation. 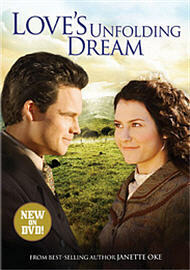 The sixth installment of her best-selling series, “Love’s Unfolding Dream,” was released on DVD on May 6th, 2008. “Love’s Unfolding Dream” tells the story of a young girl torn between following her passion to a career as a doctor or holding to traditional values of the time and giving up her dreams for the man she loves.